POPS GUSTAV: Bronze Beauties #4: PLOP! 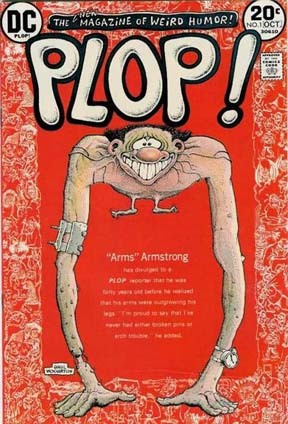 One of my favorite comics of all time, PLOP! was DC Comics' 1970s answer to MAD (the only remaining publication of DC sister company EC comics). Billed "The magazine of weird humor!," PLOP! used the same "borrowed" format as their mystery (not quite strong enough to be "horror") comics, THE HOUSE OF MYSTERY, THE HOUSE OF SECRETS, THE WITCHING HOUR, etc., teaming those books' hosts, Cain, Abel and Eve (a witch, not their mother) in introductory pieces drawn by the legendary Sergio Aragonés. The stories would usually be morality tales with a sick, comedic bent in which the protagonist usually met an untimely end accompanied by the titular sound effect. Sadly neglected by comics historians, PLOP! featured some truly stellar work by artists such as Berni(e) Wrightson, Alex Toth, Frank Robbins, Alfred Alcala, Ric Estrada, Lee Marrs and Aragonés. 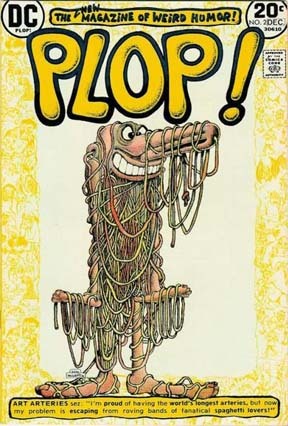 Most issues featured covers by Basil Wolverton and Wally Wood contributed some as well. Early issues featured no ads and the back covers reprinted the front art with no text. Unfortunately, the book's editor, EC alumnus Joe Orlando found himself too busy to continue overseeing PLOP! He was replaced with writer Tony Isabella, who didn't quite grasp the PLOP! esthetic. By issue 21, the book was increased to a giant sized comic, but was mostly filled with lame panel gags and other filler. PLOP! came to an end with #24, dated December 1976. Someday perhaps some smart collected editions editor will put together a "Best of" book, but until then try to find those early issues on eBay (they usually don't go for much). Here are the brilliant covers to PLOP! #1 (Oct., 1973) and #2 (Dec., 1973) both by Wolverton.